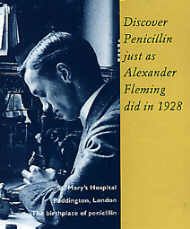 The English microbiologist Alexander Fleming noted in 1928 that bacteria cultures which had been attacked by a mould, Penicillium notatum Westl., were free of bacteria around the mould. Two English chemists, Howard Florey and Ernst Boris Chain, were then able to isolate a chemical substance that had the effect of killing bacteria. They called it penicillin. It was now possible to cure bacterial infections that had previously been impossible to cure. In the first years however the supply was very limited and therefore during the second World War only the armed forces were treated with penicillin. Improvements in growing penicillin cultures meant that supplies could be increased and soon even civilians with bacterial infections could be treated. It was a great discovery for which Fleming, Florey and Chain received the Nobel Prize in 1945. A light microscope image of a penicillin strain. However, even Swedes can take some of the credit of this discovery as a Swedish professor in pharmacognosy, Richard Westling was the first to describe the mould in botanical terms in 1911. This explains the “Westl.” at the end of the scientific name. He is even said to have observed the bacteria free zone around the mould as early as 1907 but did not publish his findings. Bacteria can get used to products such as penicillin if they survive a course of treatment. They develop resistance. This is why it is vital that new variants of antibiotics – bactericidal products – are developed continually. Since the discovery of penicillin, more than 6,000 similar substances found in nature, have been isolated. Around 100 of these are being used within medicine worldwide today. However, bacteria are still developing resistance to antibiotics, including multi-resistant bacteria – i.e., bacteria that are capable of surviving different forms of antibiotics. When using antibiotics against a bacterial infection, one feels much better after a few days since the bacteria are weakened and their numbers reduced. However, they are not yet defeated. It takes several more days of treatment before the bacteria disappear completely. If the treatment is stopped too early, the bacteria will increase numerically again, but this time possibly in a form that may be resistant to the drug being used. That is why it is vital to complete a course of treatment of penicillin or other antibiotic cure so that the bacteria really do die. 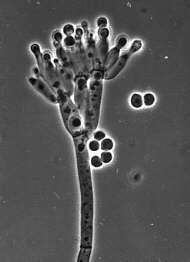 Mould fungi and microfungi have also contributed other substances which have been developed into drugs, for instance for reducing blood pressure. A microfungus from the Norwegian mountains has contributed with a substance, cyclosporine, which inhibits the defences of the body’s immune system. This makes it useful with illnesses where the body has lost control over its immune defences, which results in the immune defence system turning against its own body rather than against the intruder. Substances like these are also good in the case of transplantations since they can stop the body rejecting the new organ.